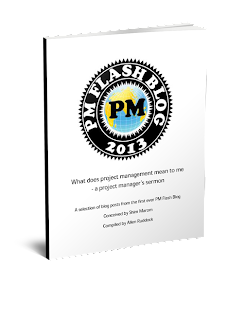 Musings on project management: Agile -- shocking revelation! "Lots of this agile stuff is hypocritical, it preaches evolution and change, [and] ... Agile methods are supposed to facilitate innovation through iterative development followed by inspection and adaption. They [presumably agile teams] practice the scientific method of measurement and feedback on products and team work; so why are the agile practices themselves magically exempt from this precious evolution? I believe there are two main reasons; first off, it is to protect inexperienced agile practitioners from themselves. ...."
The other reason is a little more sinister. Most of the creators, proponents and promotors [SIC] of agile methods have interests in keeping the methods pure vanilla. This is so they can create training courses, certifications and web sites for them. While scrum, as one example, has its specialized ceremony names and products you can neatly market services for it. If you allow or encourage people to change it then the result is not so proprietary and more difficult to defend, promote and assert ownership over. Hello! Trying to exploit a somewhat proprietary methodology for the money ... simply beyond the pale! First off, in the spirit of full disclosure, I should explain that I was involved with the creation of the agile method DSDM and have worked with agile groups like the Agile Alliance (I was a board member for a couple of years) and helped create several agile certifications (iCAgile, DSDM Leadership, PMI-ACP). So, I am not immune from the pulls of standardization, but hopefully that adds some credibility to my encouragement to rise up and evolve your methods. The biggest threat to agile I see is not dilution and confusion, it is obsolescence and abandonment because they are not keeping up with new demand of collaborative teams. 3. Ri: Unconsciously finding an individual path (ri means to go beyond or transcend)"
I associate myself with all of these sentiments. I think leadinganswers is spot-on. My book on agile methods, pictured below, and my book on managing project value, also below, are not methodology bigots. I unashamedly borrow the best. And, so it should be. Anybody who can afford two days in a hotel ballroom can buy the credential of "scrum master". Lets not be a slave to the proprietary.